Last week I featured an award winning chili recipe developed by The Food Network creator Jack Clifford. 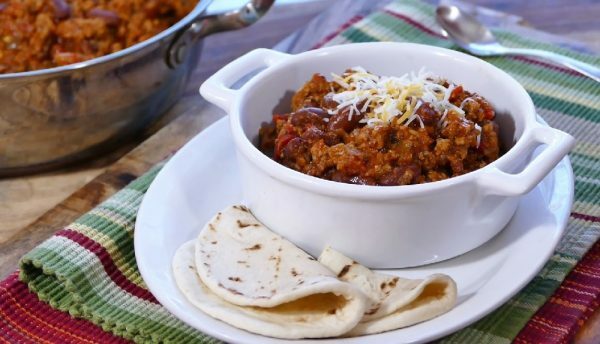 This week I’m featuring another chili recipe, with turkey instead of beef and pork. Now, I always vary my columns, but the minute I found out about this story and then tried the recipe, I didn’t want to wait another minute to share it with you. The recipe comes from Phoenix resident Lila Baltman. Here’s her story! “It was back in 2016 when my son was an 8th grader at Rancho Solano Preparatory School in Scottsdale. The middle school decided to host their first-ever “Dads Chili Cook-Off.” The minute I learned about the chili competition I knew I wanted to enter my turkey chili recipe. (It has always received such rave reviews.) So, I entered the Dads Chili Cook-off under Rick’s name, and my loving, supportive husband agreed to go in on the culinary ruse with me. All Rick had to do was agree to be there at the school on the night of the Cook-Off, don an apron, dole out samples to the crowd, and learn my recipe ingredients enough to answer basic questions from the crowd of tasters. There were three winning categories – Spiciest Chili, Most Unique Chili, and Best All-Around. Rick Baltman became the official winner of the Best All-Around Chili and was awarded a beautiful engraved Calphalon wooden spoon. My husband enjoyed lots of compliments and congratulations that night and I just stood back and did a lot of smiling. But to this day, every time I see that award-winning wooden spoon in our kitchen, I know that spoon is really mine! Here’s my recipe for everyone to enjoy. Happy holidays!” Lila, I’m happy to give credit where credit is due. Love the chili!